Join Wellmark Blue Cross and Blue Shield and Drake Relays in celebrating 10 years of Grand Blue Mile! The annual event brings friends and families together to celebrate wellness through a one-mile street run in Downtown Des Moines suited for all ages and abilities. Your Race. Your Pace. Your Mile. Choose the tier that fits you best! From competitive to recreational, there’s something for everyone at the Grand Blue Mile! Since 2010 Grand Blue Mile has been making it easy for everyone from young families to advance athletes to get active. We’ll see YOU at the finish line. Named for railroad man C.T. Granger, Granger (population 1,244) has a history that is intertwined with transportation infrastructure. Up until the 1960s, it was a way point on two key railroad lines in central Iowa. 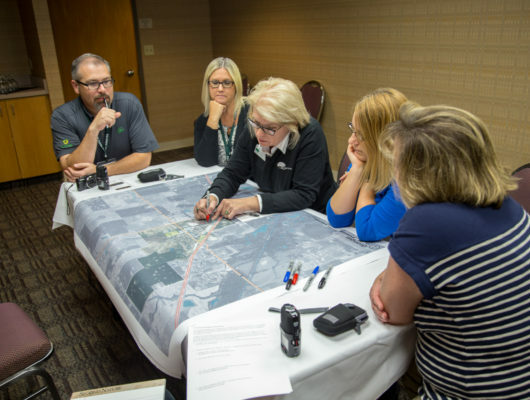 Currently, with two major highways dividing new developments from Granger proper, connectivity is the primary goal for Granger’s participation in community visioning. The results of the focus-group and random-sample survey assessments show that Highways 141 and 17 are considered barriers, particularly for pedestrians and cyclists. The assessments also reinforce the importance of trails and trail connections to residents. People want pedestrian/cyclists connections not only within Granger, but to the wealth of regional trails in the area. Highways 169 and 17, Sycamore Street, and State Street – Improve pedestrian safety and promote traffic calming with new crosswalks at high-traffic highways and local streets. Local Trails – Create a loop trail system along Oxley Creek and Highway 141 to connect downtown, parks, and schools to neighborhoods. Regional Trail Connections – Develop separate and on-road bike trails to provide direct access between Granger and Jester Park, the Raccoon River Valley Trail, the High Trestle Trail, Beaver Avenue Trail, and cities in the north Des Moines metro area. Downtown/Main Street – Implement enhanced way-finding and improve the aesthetic character of Main Street. Community Gateways – Add iconic gateway monuments and park space along Highway 141 to attract passersby and welcome them to Granger.